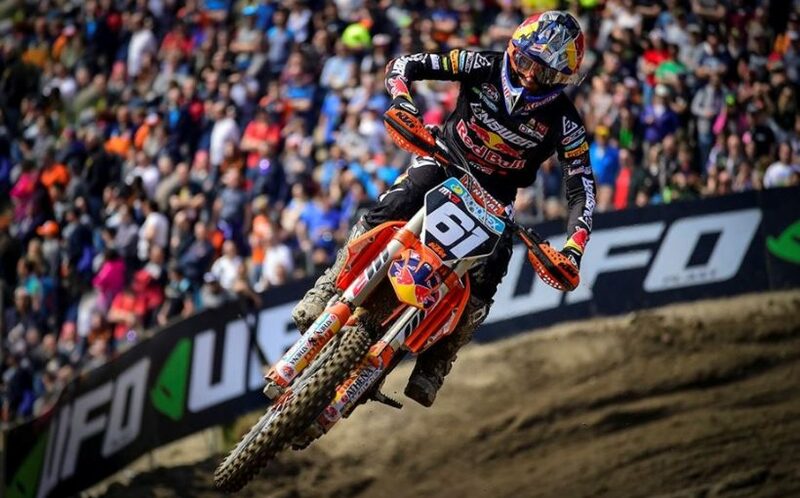 HERLINGS AND PRADO TRIUMPH AT TRENTINO. 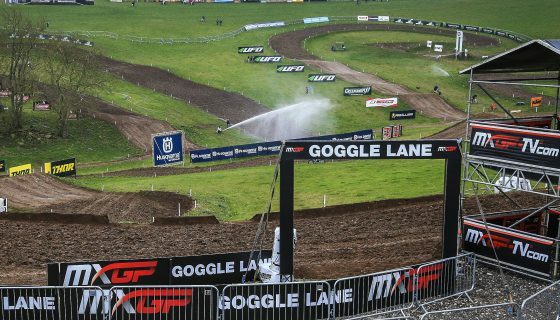 The 2018 MXGP of Trentino has concluded at the spectacular Pietramurata circuit! 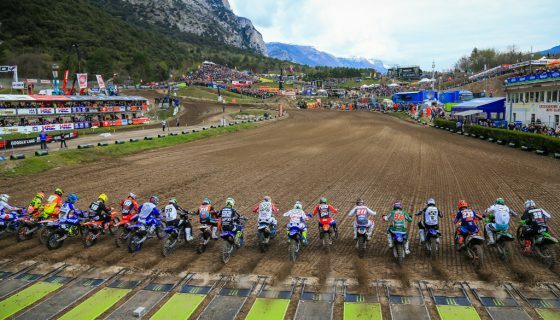 Over 30,000 enthusiastic Italian motocross fans witnessed the best riders of the world championship fighting for the top step of the Trentino podium. 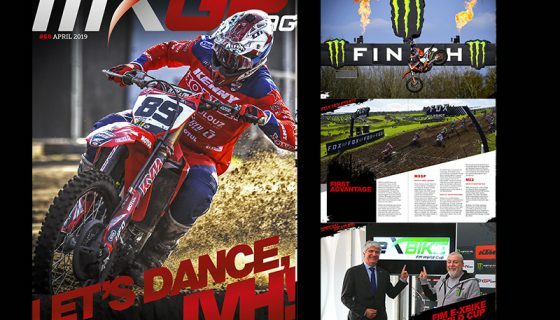 Taking emphatic victories were the pair of Red Bull KTM Factory Racing riders, Jeffrey Herlings and Jorge Prado. Red Bull KTM Factory Racing’s Jeffrey Herlings has struggled off the start of nearly every race this season up until this weekend. A top priority of Herlings and his team was to improve his starting and it clearly worked when he took his first Fox Holeshot of the season, the second of his MXGP career in MXGP Race 1. Behind Herlings on the start was Monster Energy Yamaha Factory MXGP’s Romain Febvre, Monster Energy Kawasaki Racing Team’s Clement Desalle, Team HRC’s Tim Gajser, and home GP star and Herlings main championship rival, Red Bull KTM Factory Racing’s Antonio Cairoli. By the end of lap one Desalle made his way forward past Febvre into 2nd but Cairoli dropped from 4th to 8th which he later stated was due to an issue with his front brake. Once back to normal Cairoli started to charge back to the front passing riders such as his teammate Glenn Coldenhoff and later Gajser among others. While Cairoli tried to regain positions Desalle kept Herlings in sight the majority of race leaving Febvre in a race of his own. At the finish Herlings won by a little more than 5 seconds over Desalle who had Febvre another 7 seconds behind him. Cairoli took rebounded to finish the race right where he started, in 4th. In race 2 Cairoli took his 6th FOX Holeshot of the 8 races this season but Herlings was right in tow along with Glenn Coldenhoff making it a perfect start for the Red Bull KTM Factory Racing team. Another good start was taken by Clement Desalle who led the newly signed Marchetti Racing Team KTM of Benoit Paturel and the Monster Energy Yamaha Factory of Jeremy Van Horebeek. For the first three laps Herlings chased Cairoli but on the uphill just after the finish Cairoli missed his breaking point and expected Herlings to go wide who instead dove to the instead and took the lead. Following the pass Cairoli briefly lost touch with Herlings before reeling the #84 back in. Herlings consistently put in one fast lap after another to which Cairoli was unable to match. In the meantime Rockstar Energy Husqvarna Factory Racing’s Gautier Paulin spent 17 laps looking for a way around Van Horebeek in 5th and with only 2 laps remain took the spot from the Belgian. MXGP Race 1 Top Ten: 1. Jeffrey Herlings (NED, KTM), 34:45.091; 2. Clement Desalle (BEL, Kawasaki), +0:05.628; 3. Romain Febvre (FRA, Yamaha), +0:12.837; 4. Antonio Cairoli (ITA, KTM), +0:27.281; 5. Tim Gajser (SLO, Honda), +0:31.477; 6. Gautier Paulin (FRA, Husqvarna), +0:42.857; 7. Glenn Coldenhoff (NED, KTM), +0:46.757; 8. Jeremy Seewer (SUI, Yamaha), +0:48.233; 9. Julien Lieber (BEL, Kawasaki), +0:55.110; 10. Jeremy Van Horebeek (BEL, Yamaha), +0:56.049. MXGP Race 2 Top Ten: 1. Jeffrey Herlings (NED, KTM), 34:31.212; 2. Antonio Cairoli (ITA, KTM), +0:20.185; 3. Clement Desalle (BEL, Kawasaki), +0:31.052; 4. Glenn Coldenhoff (NED, KTM), +0:35.707; 5. Gautier Paulin (FRA, Husqvarna), +0:38.637; 6. Jeremy Van Horebeek (BEL, Yamaha), +0:39.536; 7. Romain Febvre (FRA, Yamaha), +0:40.462; 8. Tim Gajser (SLO, Honda), +1:04.740; 9. Evgeny Bobryshev (RUS, Suzuki), +1:08.638; 10. Jeremy Seewer (SUI, Yamaha), +1:09.626. MXGP Overall Top Ten: 1. Jeffrey Herlings (NED, KTM), 50 points; 2. Clement Desalle (BEL, KAW), 42 p.; 3. Antonio Cairoli (ITA, KTM), 40 p.; 4. Romain Febvre (FRA, YAM), 34 p.; 5. Glenn Coldenhoff (NED, KTM), 32 p.; 6. Gautier Paulin (FRA, HUS), 31 p.; 7. Tim Gajser (SLO, HON), 29 p.; 8. Jeremy Van Horebeek (BEL, YAM), 26 p.; 9. Jeremy Seewer (SUI, YAM), 24 p.; 10. Maxime Desprey (FRA, KAW), 19 p.
MXGP Championship Top Ten: 1. Jeffrey Herlings (NED, KTM), 191 points; 2. Antonio Cairoli (ITA, KTM), 181 p.; 3. Clement Desalle (BEL, KAW), 145 p.; 4. Romain Febvre (FRA, YAM), 135 p.; 5. Gautier Paulin (FRA, HUS), 129 p.; 6. Glenn Coldenhoff (NED, KTM), 111 p.; 7. Jeremy Van Horebeek (BEL, YAM), 104 p.; 8. Jeremy Seewer (SUI, YAM), 83 p.; 9. Tim Gajser (SLO, HON), 77 p.; 10. Julien Lieber (BEL, KAW), 72 p.
MXGP Manufacturers: 1. KTM, 200 points; 2. Kawasaki, 145 p.; 3. Yamaha, 143 p.; 4. Husqvarna, 133 p.; 5. Honda, 92 p.; 6. TM, 68 p.; 7. Suzuki, 48 p.
Red Bull KTM Factory Racing has been unstoppable so far this year and while the first 6 successful races of the season were thanks to wins Pauls Jonass, his younger teammate Jorge Prado has been on the brink of taking a GP himself. Today the #61 took both of the MX2 FOX Holeshots and in race 1 led every lap on his way to a dominant win. Prado closest competition in race 1 came from STC Racing Husqvarna’s Henry Jacobi. Jacobi battled to hold off Rockstar Energy Husqvarna Factory Racing’s Thomas Kjer Olsen. For the first 11 laps Jacobi was successful but Olsen finally found a way by the #29. Jonass was then the next rider to catch Jacobi but instead of being passed Jacobi dug deep and instead passed Olsen 3 laps before the finish. Prado crossed the line 7.6 seconds ahead of Jacobi with Olsen, Jonass, and Rockstar Energy Husqvarna Factory Racing’s Thomas Covington rounding out the top 5. Race 2 was again led by Prado from the start but Covington followed closely. Team HRC’s Calvin Vlaanderen redeemed himself after crashing out of race 1 on the start by running in third to start race 2. Jacobi also started well and by the second lap was around Vlaanderen and into 3rd. Kemea Yamaha Official MX Team’s Vsevolod Brylyakov had a break through performance in race 2 after starting in the top five and passing both Vlaanderen and Jacobi to take over third. Vlaanderen returned the favor of being passed to Jacobi on lap 11. On the following lap Jonass and Jacobi came together sending both riders down. Both riders however were able to get up and finish the race. At the front Covington pressured Prado one lap after another which was to no avail until the 19th and final lap where Covington took the lead and race win in a dramatic ending. Regardless of the 2nd in race 2 Prado took his second MXGP of Trentino overall victory in 2 years over Covington and Jacobi who took his first ever MX2 podium finish. Martin Racing’s Michelle Cervellin returned to the MX2 class at home this weekend after missing rounds 2 and 3 with a knee injury. Cervellin lives less than an hour from the Pietramurata circuit and made his hometown fans proud taking 7th overall after his 6th and 11th race finishes. Herny Jacobi shared his thoughts on his first Podium: I hope I can stick to this performance and continue to ride like that, I know I’m fast, I just need to finish it. In Valkenswaard I crashed and at Redsand also but I think if I find some consistency I can get some more top fives or podiums. MX2 Race 1 Top Ten: 1. Jorge Prado (ESP, KTM), 35:49.470; 2. Henry Jacobi (GER, Husqvarna), +0:07.613; 3. Thomas Kjer Olsen (DEN, Husqvarna), +0:10.550; 4. Pauls Jonass (LAT, KTM), +0:11.771; 5. Thomas Covington (USA, Husqvarna), +0:12.890; 6. Michele Cervellin (ITA, Honda), +0:18.733; 7. Jago Geerts (BEL, Yamaha), +0:30.941; 8. Davy Pootjes (NED, KTM), +0:38.538; 9. Vsevolod Brylyakov (RUS, Yamaha), +0:39.870; 10. Adam Sterry (GBR, Kawasaki), +0:43.836. MX2 Race 2 Top Ten: 1. Thomas Covington (USA, Husqvarna), 35:29.253; 2. Jorge Prado (ESP, KTM), +0:02.170; 3. Vsevolod Brylyakov (RUS, Yamaha), +0:24.692; 4. Conrad Mewse (GBR, KTM), +0:30.510; 5. Calvin Vlaanderen (RSA, Honda), +0:32.592; 6. Davy Pootjes (NED, KTM), +0:37.204; 7. Ben Watson (GBR, Yamaha), +0:38.459; 8. Jed Beaton (AUS, Kawasaki), +0:41.585; 9. Pauls Jonass (LAT, KTM), +0:57.055; 10. Henry Jacobi (GER, Husqvarna), +0:57.795. MX2 Overall Top Ten: 1. 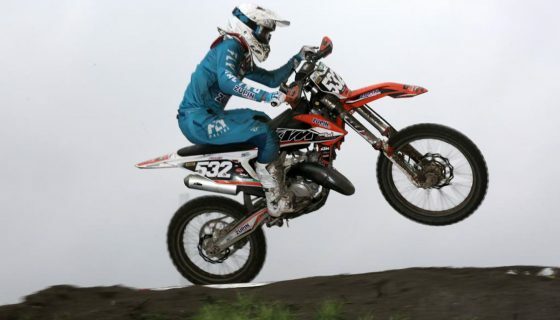 Jorge Prado (ESP, KTM), 47 points; 2. Thomas Covington (USA, HUS), 41 p.; 3. Henry Jacobi (GER, HUS), 33 p.; 4. Vsevolod Brylyakov (RUS, YAM), 32 p.; 5. Pauls Jonass (LAT, KTM), 30 p.; 6. Davy Pootjes (NED, KTM), 28 p.; 7. Michele Cervellin (ITA, HON), 25 p.; 8. Thomas Kjer Olsen (DEN, HUS), 25 p.; 9. Ben Watson (GBR, YAM), 24 p.; 10. 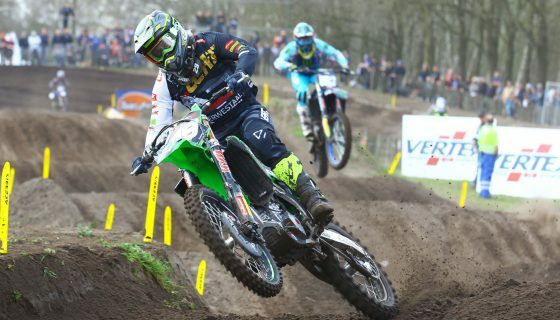 Jago Geerts (BEL, YAM), 22 p.
MX2 Championship Top Ten: 1. 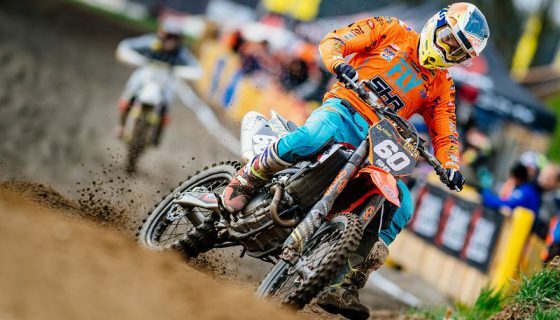 Pauls Jonass (LAT, KTM), 180 points; 2. Jorge Prado (ESP, KTM), 152 p.; 3. Thomas Kjer Olsen (DEN, HUS), 145 p.; 4. Ben Watson (GBR, YAM), 105 p.; 5. Conrad Mewse (GBR, KTM), 100 p.; 6. Hunter Lawrence (AUS, HON), 99 p.; 7. Thomas Covington (USA, HUS), 91 p.; 8. Jed Beaton (AUS, KAW), 91 p.; 9. Vsevolod Brylyakov (RUS, YAM), 86 p.; 10. Calvin Vlaanderen (RSA, HON), 79 p.
MX2 Manufacturers: 1. KTM, 197 points; 2. Husqvarna, 167 p.; 3. Honda, 131 p.; 4. Yamaha, 123 p.; 5. Kawasaki, 121 p.; 6. TM, 41 p.